In the late 1960s Port Talbot council began a regeneration project that would make it almost impossible to recognise the town centre by the mid 1970s. The building of the M4 flyover in the limited amount of land between the sea and the town’s three mountains, Mynydd Margam, Mynydd Emroch and Mynydd Dinas, had already meant the disappearance of a number of landmarks, including Capel Moriah, Vivian Square and Carmarthen Row, and in 1971 most of what was left of the old town was demolished so a modern indoor shopping centre could be built in the neo-brutalism style that scarred so much of the country at that time. My memories of the town post 1971 are vague even though I didn’t move away until 1978. When I think of the town it’s always the old town that comes to mind: the market building, Oliver’s shoe-shop in Water Street where my mother took me to buy my school shoes, the short cut past the back of the Walnut Tree Hotel to the corner of David Evans on the High Street, the bridge over the Afan into Bethany Square and its imposing stone chapel in shades of blue and brown that I still think is magnificent today in spite of its overgrown steps and boarded up windows and door. wasn’t necessary to destroy so much of the old. The loss of the old market building feels particularly sad, perhaps because an appreciation of markets and farmers’ markets has been growing in recent years. And perhaps because of the atmosphere these old markets seem to retain. There’s a kind of stillness that exists above the bustle and noise of crowds: something in the air that might even transcend time. It was Swansea market where my mother bought laver bread (Bara Lawr), wrapped up in a packet of smooth white paper, and my sister ate cockles drenched in vinegar and white pepper from an open bag. I was always suspicious of them, could never bring myself to trust them not to move if I placed one in my mouth. But I ate the laver bread, tasting it from my dad’s plate after my mother had heated it in the fat left from frying the bacon. There is nothing to compare it to. Richard Burton is said to have called it ‘poor man’s caviar’ but the texture is smoother than that. And yes, it’s salty but much deeper in taste than caviar due to its iodine and iron content. It’s like the sea itself, rather than something that belongs to that element. Our laver bread probably came from Penclawdd on the Gower Peninsula, the laver, or edible seaweed, collected, boiled for several hours then minced or pureed. Its richness means that a little goes a long way; its unique flavour means that it’s an acquired taste. Like olives. Or oysters. But like both of those things, once you have cultivated a taste for it a little germ of addiction is sown. But opening a box and a tin is just not the same as standing in the muted light of an old market building, a slight chill in the air, and waiting for a smooth, cool, white packet to be placed in your palm across a stall. Time for a cup of tea now and the only time you’ll throw your empty sugar packets on the floor. Write about something that has disappeared. Write about a fear of eating something. Write about making a cup of tea. Do you know, I've never heard of laver bread - now just where have I been? :) I adore cockles though with lots of vinegar - and WINKLES! Oh boy. The things you miss when you're an expat. What a wonderful thing, bread made from seaweed. I've always wanted to try it, but think I'd like to wait for the fresh version. I wonder, have you seen it in London ever? I'm headed there in July. Bread made from seaweed I've never heard of laver bread.Interested post! Enjoyed your page, great work! I think the 'bread' is probably misleading... as it's nothing to do with literal bread... and (but I'll have to check with someone who's fluent in Welsh) that the bread part (bara, in welsh) might be more to do with sustenance. @ Angela - the only place I could imagine it being in London is Borough Market... and I imagine that's already on your list. @ Sue R - be afraid, be very afraid! No, really, it's lovely (but it's in my genes). And re missing things as an expat - it's british sausages I miss the most! @ Marinela - thank you so much for the encouragement. Hope to see you here again. before speaking words that will haunt for ever. Hi Martin - this is lovely. You manage to draw a parallel with personal strife and a more universal tragedy without a trace of didacticism. Great poem. I enjoyed your memories of the old town. I too only remember snippets of how it once was and like you the market is central to these memories. I remember the toy stall and of course Peacocks, the best underwear in town. As for the Lava bread, I enjoy it drenched in vinegar and served with cockles as part of a full Welsh breakfast. 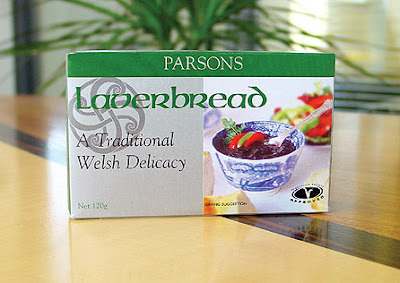 I have no idea how I happened on your post, but as Bridgend girl living in Edinburgh who has parsons laverbread and cockles delivered at regular intervals,thats me know a fan! Hi Lianne - I've never added vinegar to laverbread but will try it! Hi Linda - thanks for the tip. I'm on a mission now!